There's more to magic than meets the eye. Studies show that teaching children how to perform magic tricks can help with personal growth in a variety of ways. Magic, at any skill level, requires good hand-eye coordination. By learning a few fun magical effects, children improve in this area of development. Hand-eye coordination is vital in lots of areas of life. It can be applied to academic subjects, such as math and science, where being able to apply concepts becomes more important as education progresses. Hand-eye coordination also benefits young athletes and people with special needs. Likewise, top magician David Copperfield taught sleight of hand to occupational therapists, who in turn today teach physically challenged patients magic to aid in their rehabilitation. Magic can function on several different levels, helping to improve dexterity, coordination, visual perception, spatial relationships and cognitive skills. It also builds self-confidence as it often places aspiring magicians in a room full of people. This is incredibly useful for shy children. Magic also gives kids an edge in order to succeed later in life. 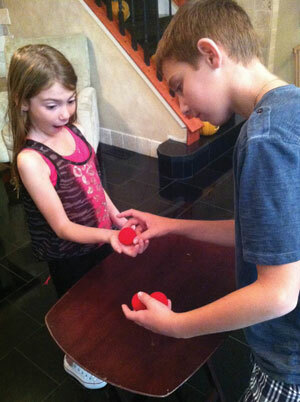 As a bonus for parents, performing illusions gets kids off the computer and into the real world, forcing them to develop interpersonal skills. Illusions hold many of the same qualities as puzzles. Studying any trick requires questioning and makes the thought process more inquisitive. When watching professionals, your tyke might ask, “How did that trick work?” Searching for questions and, ultimately, answers spills over into other areas of life. With their newfound confidence and endemic need for new knowledge, kids are more likely to question concepts. And by them being emboldened to ask questions, children gain knowledge. Learning tricks, although great fun, does require study and practice. But with magic, kids discover that studying is not boring. The realization that study can lead to positive outcomes spills over into other areas. Along with some parental encouragement, learning becomes entertaining. Children who may have turned away from other topics realize that knowledge is power. The more youngsters learn and grow, the more eager they are to acquire information. By making learning an enriching activity, you’ll find kids wanting to learn everything they can. A great bonus is that if the child gets a nice show together, he can charge his friends or organizations an admission fee for shows. The money could be saved in a college tuition fund. For New York City families looking to explore the world of magic, there is Fantasma Magic and the Houdini Museum of New York. Young magicians in the making can choose from a large selection of magic for sale at reasonable prices. Stop by any day of the week for demonstrations or ask staffers to recommend age-appropriate tricks. Private and group classes for children are also available. Keep in mind, if you introduce your child to the art of illusion, you may be surprised at how his grades and attitude improve— like magic! With all of these facets in place— improved confidence, the ability to question, heightened performance, interpersonal skills and a thirst for knowledge— it is easy to see how learning magic would improve a child’s grades and opportunities for success in the real world. For more information on Fantasma Magic, which is located at 33rd Street and Seventh Avenue, log onto www.fantasmamagic.com. Simon Lovell is the star of the Off-Broadway show Strange and Unusual Hobbies, a contributing writer for White Collar and often found having fun at Fantasma Magic.